We liked Patchwork, and would recommend it to almost anybody for a light but tactical dueling experience in the post-catastrophe wastes of the quilting apocalypse. Welcome to the Threaderdone. We gave it four stars in our review. We think most people would like it. The question is – could most people play it? Let’s find out! For those with Protanopia or Deuteranopia there is limited differentiation between the score markers, but you can still tell the difference. 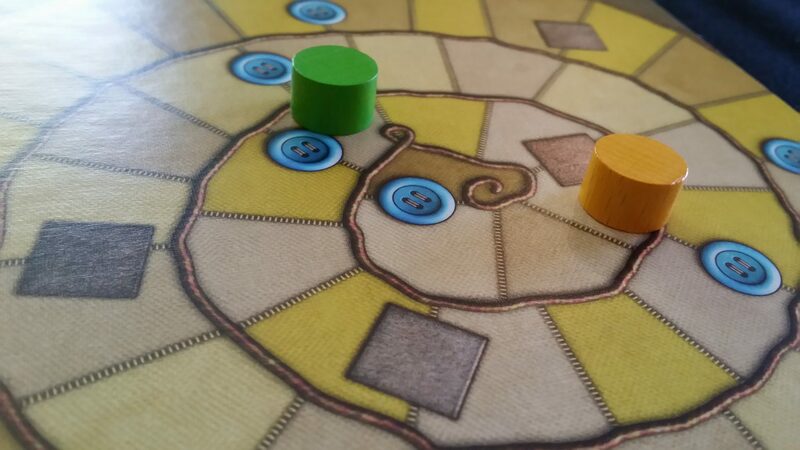 Being a two player game, it’s much harder to lose track of where you are in relation to the other player, and you can just focus on being the light yellow or the darker yellow. Or yellow and gold. Or whatever. I’m not your boss, call it whatever you like. Call it paisley, or vermilion if you prefer. 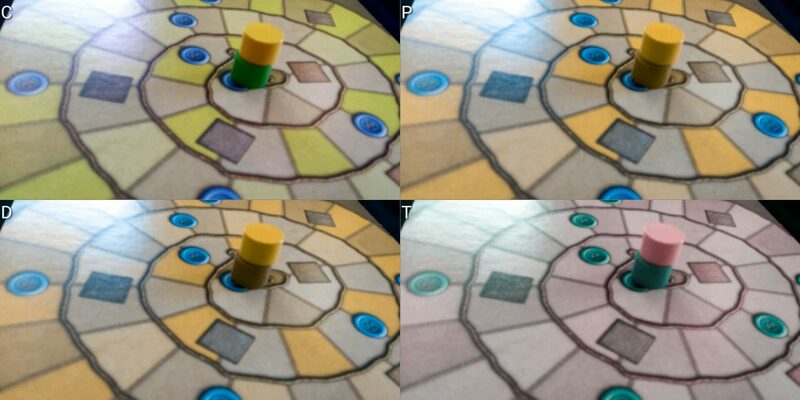 If the colour scheme is not to your liking, these are the only colour sensitive tokens in the game and you can replace one (or both) of them with standard meeples if you prefer. Nothing is lost in doing this. The quilts actually look a lot less ugly when you’re colour blind. I think you can do that very easily. The patch sections are visually distinctive enough without requiring colour differentiation, and the key gameplay information (button income and cost) are all marked out in text on each of the pieces. I’ll take the yellow one, next to the yellow one. It’s great to be able to be positive here for once. We’re giving this a strongly recommended although we’re making it a minus because come on guys – there are only two tokens, you could have easily made them unambiguously distinct. There is another positive story in this category. The uniqueness of each tile in the game gives everything a great degree of tactile distinctiveness, and the physicality of the game means that even those that are completely blind can meaningfully play. It’s not necessarily the easiest thing in the world to slot together some of the stiffer pieces purely by touch, but it’s something that absolutely can be done. The only thing that could realistically have improved it in this category would be some tactile indentations or raised grid-lines. I would have liked to have seen that as a usability aid to everyone, in fact. Rather than having to slide pieces around a glossy grid, it would have been great if they clipped in, or nestled into small grooves to keep them a little more secured. There is though a uniformity to the patches that can be relied on to indicate the size. You can tell by finger widths how many tiles a piece will take up, and then run your fingers over the board to see how many tiles are blank and where. The problem is that in doing so you risk mis-aligning everything you’ve already put in place because nothing anchors it to the board. It’s a lost opportunity rather than a serious problem – one of my professional mantras in the area of accessibility is that ‘accessible interfaces are good for everyone’. I would have loved grid markers on the patches, and I think it would have been a hugely considerate addition. For those with less severe visual impairments, the story remains reasonably positive – the text of the cost information is large and well contrasted, and the design of the game permits for you to pick up pieces and hold them close, or bring them up to a magnifier. Information contained on the patches is succinct – two numbers, two symbols, and that’s all. This is the area in which those with more severe impairments will need to rely on a second player – there is no tactile indication of cost or presence of buttons on the patches. Does anyone actually play with this board? It’s such a great accessibility consideration that I grinned ear to ear when I saw it. Most reviews I have seen talk about it as being just an aesthetic choice, but it’s a massive accessibility boon. It means that no longer does a visually impaired player need to peer and strain to make out lines and buttons and patches. They can instead flip over to a version that’s much easier to see, with much higher contrast, while losing nothing of value. It’s the side of the board I use when playing, for interest’s sake. We’ll talk more about why in the intersectionality discussion, but while they can all be identified by touch there’s a degree of ambiguity between five and ten that didn’t have to be there. All the other button stacks – great work. The button cost is always on the left, so orientation isn’t an intractable problem. Just an occasional one that may even catch out sighted players once in a while. 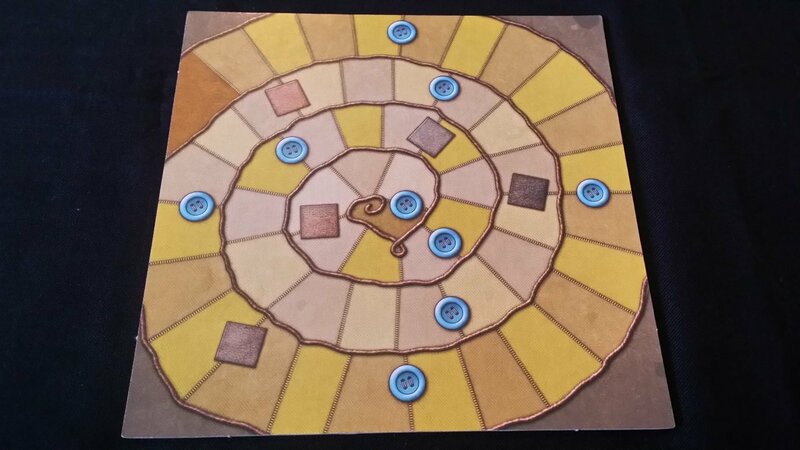 If there were to be a future printing of this, and the guys at Mayfair were to implement guidelines for the quilts and time track, and a little more tactility in the coins and costs, this would be a masterclass in offering visual accessibility in a visually oriented game. With a few changes in the printing, Patchwork is a title that I think two completely blind players could feasibly play and enjoy without any assistance. As it is, we strongly recommend it because what flaws there are can be compensated provided there is someone else that can keep a player with visual impairments properly oriented. My view is that the strategic weight of decisions in Patchwork is actually a clever trick of smoke and mirrors. It seems like a game that carries a lot of weight in each turn since you need to think ahead, and think across the board, and balance time versus income versus coverage. As we discussed in the review though, in practice there is far more filtering of choices than you might think, meaning that the feasible options you have for any given move are limited. As such, it’s possible to play effectively just focusing on the job that’s in front of you – what tiles you can get, what they cost, and how much of your quilt you’ve got completed. Sure, in ultra-competitive settings a good Patchwork player is probably going to consistently beat the self-absorbed quilt-maker, but if you’re just playing for fun there’s no reason it can’t be as calming and absorbing as needlework itself. As with Carcassonne, there’s a variant in here where you abandon scoring and can still have a fun experience. For those with especially severe cognitive impairments, that’s the version of Patchwork we’d be happy to recommend. For those that want the competitive angle, you have to bear in mind the difficulty of enacting the strategies that Patchwork theoretically permits for you to consider. 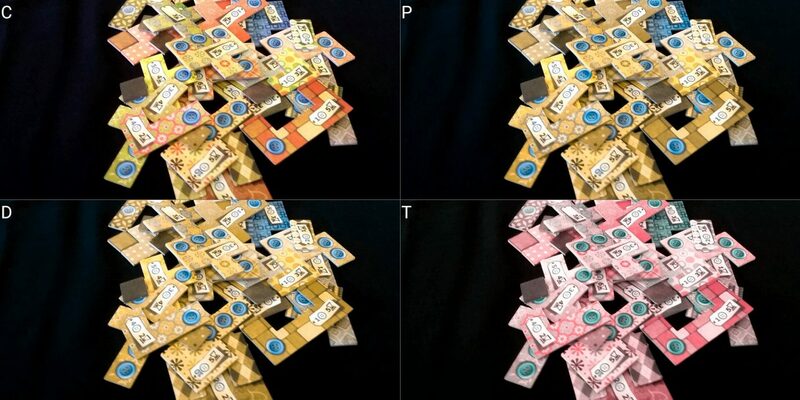 There’s a cognitive cost to deciding what patch you want and engineering the strategy that will bring it to your quilt. Given the other player is actively engaged in throwing some chaos into that process anyway, I’m not sure you’d lose too much if you had to abandon that part of the game. Shaping the flow of availability of patches is a powerful tool when you can pull it off. However, pulling it off consistently is difficult, and failure often put you at a disadvantage. Even if you couldn’t effectively cognitively process that kind of gameplay choice system, you’re still well placed to play Patchwork reasonably well. The game has no mandatory text on the patches – everything is handled via a simple symbolic language – buttons are money, and egg-timers are time. Leather pieces are physical artefacts on the time track, and they’re picked up when they’re gone so there’s nothing to confuse or obscure when it comes to state tracking. Rules too are very simple – pay X buttons, place the patch you bought, move your token Y spaces along the time track. 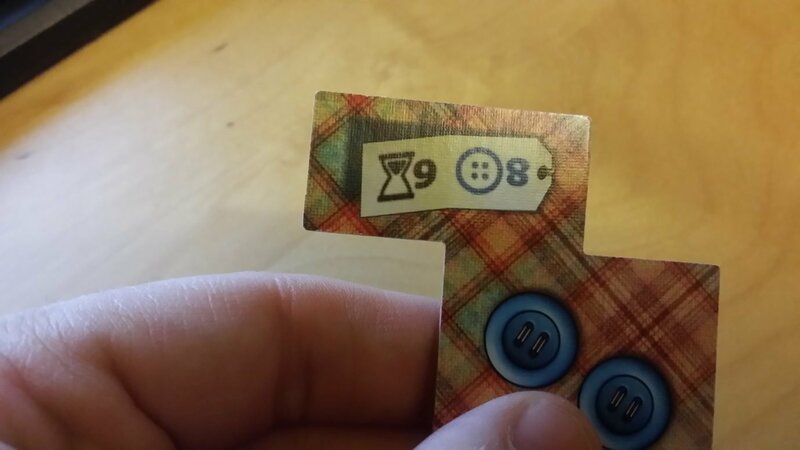 If you pass a button on the time track, count your buttons on the quilt and take that many buttons. There’s no memory management required – everything is in front of you at all times, from your own quilt to your opponents to the patches left to be selected, to where you are in the circle of patches, to the time markers. As such, those with mild to moderate memory impairments are unlikely to find the game difficult to follow. There are however some areas of cognitive complexity – the process of leapfrogging another player to get cash can be a little counter-intuitive, because it will often involve passing buttons and gaining extra income. It’s rarely a case of ‘You moved X spaces, so take X buttons’. It’s ‘You moved X spaces, and passed a button, so you get X + the buttons on your quilt’. It’s obviously not a majorly taxing thing to explain, or handle for someone, but it can seem a little arbitrary if there is cognitive difficulty in breaking the elements of the chain down into its constituent parts. Turn order is a more serious issue, because it is handled in a way that is surprisingly complex. The player that is last is always the one that’s playing the next turn, which leads to a strangely staggered game flow in which one player may take two turns, another takes one, the first player takes three, then the second player takes two, and so on. It’s probably fine though as long as someone understands the basic mechanic of ‘place a piece, move your token, and the token in last place goes next’. Scoring is a matter of simple arithmetic – if basic multiplication, addition and subtraction are not a problem, neither will the scoring for Patchwork. If it is, it’s all open and easily explained, so one player can do it for the other without game impact. There’s little direct competition in Patchwork. In our review, we referred to it tongue-in-cheek as Little House on the Prairie meets the Hunger Games. In reality, while competition can be brutal and hilariously passive-aggressive, it doesn’t actually have to be. Given the uniqueness of the various patches, it’s rare that your opponent is gunning for exactly the tile you need. Even if they are, you’re rarely so starved of options that you’re never going to make progress with the quilt. There is challenge in getting a good score, but the game itself is not especially challenging turn to turn. Every turn you buy a patch, you make visible progress – there’s no need to despair at the way in which your quilt is turning out. In the end, both players usually have roughly the same number of spaces left unfilled, give or take a handful. There is a caveat to this though – early stages of the game, if you don’t manage to get a few button-bearing patches, can be frustrating. Buying patches and applying them to your quilt is a satisfying mechanic. Leapfrogging the player ahead to get a small handful of buttons is the opposite. It’s boring, it feels like a waste, and it’s something you do before you get to have fun of your own. 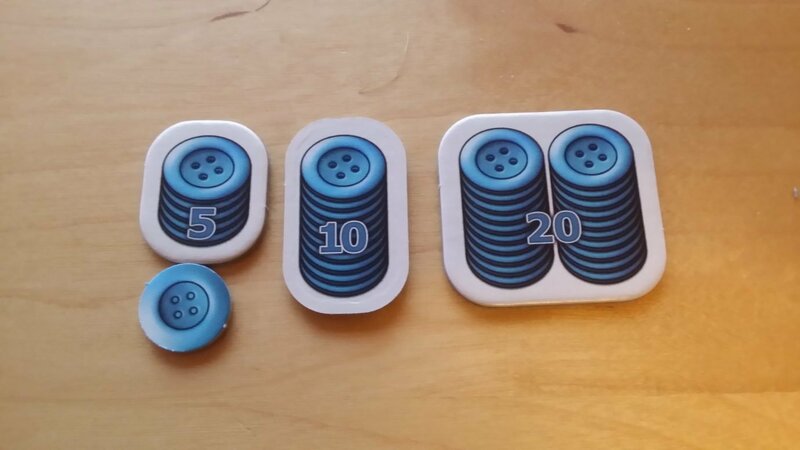 If you’re slow in getting some income generating buttons, you spend more time ekeing out coins in threes and fours than you do building up your own board. As soon as you start generating income, this problem goes away – and once you’ve made your way around half the board usually you’ve got enough buttons to splurge whenever you like. Those early stages though can make the fun look awfully like frustration. 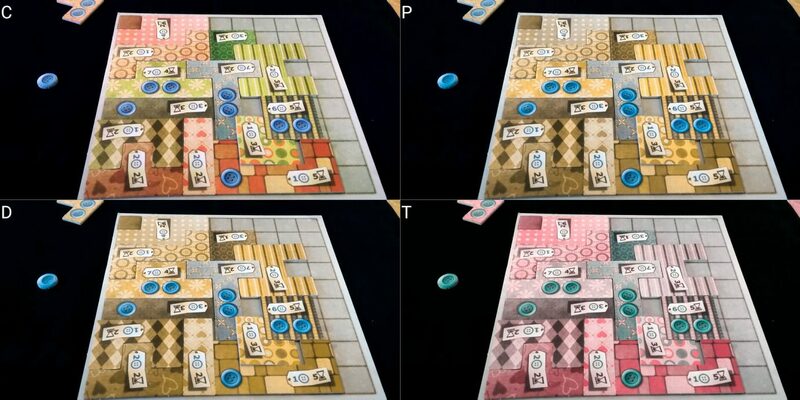 Those with a compulsive need for order may find that Patchwork is an angst-ridden game to play because it will involve constant aligning and realigning of patches, some of which may not fit together very well, on a glossy, low-friction quilt board. The slightest movement can put things out of order, and you spend a lot of time compensating for banged tables, sneezes or clumsily placed patches. Similarly, if there’s a need for symmetry or closure Patchwork wouldn’t be a great choice of a game – you’ll inevitably have parts of the quilt you can’t fill, ragged edges, and miscoloured and mismatched patterns across the entire thing. All of this is intentional, but may not play well with certain kinds of behaviour or emotional conditions. The largest issue in terms of emotiveness though is likely to be in the score disparities that the game enables. You get one point per button, minus two points per unfilled space. In our review, we saw one player got thirteen points, and the second got NEGATIVE thirty one. Games which award negative scores are always potentially fraught – if people can laugh it off, it’s great. If people feel judged or ridiculed, it’s not. You could play it with a points floor (negative points count for zero) or without the score penalty (just count buttons) but neither of those will offer the same degree of flexible play. It’s not a game where there is a huge potential for differentiating scores if you only keep track of the positives. We’ll recommend it in this category, with the usual proviso of ‘your mileage may vary’. It’s rare that a game makes it through a teardown without having at least one problematic category, and this is the one for Patchwork. It’s not a dexterity game, but it is a game of considerable physical motion. You need to orient and slot together patches, pick patches up from a common pool, and move a marker around the circle of patches and a token along a time tracker. None of it requires an individual player’s physical interaction, but the act of constructing the quilt is so inherently satisfying and so much a part of gameplay that it’s unlikely you’d enjoy the game in the same way. Pieces slot together on the quilt-board, but they don’t get anchored in it through any kind of indentations or guide-lines. They’re also sometimes difficult to properly clip together depending on the way the rest of the quilt has been constructed. There’s no space on the board to really allow for unnecessary gaps to alleviate positioning restrictions, and if you need to slot a funny shaped patch into a funny shaped gap, it’s difficult enough without physical impairments. For those with minor physical impairments, the act of placement of individual tiles can be difficult. A single twitch or spasm can put a whole board out of alignment, and the process of bringing it all back in is so pernickety and fiddly that you’d almost certainly end up doing more harm than good in a reconstruction. With Suburbia, we recommended players with physical impairments make use of hex graph paper and not worry about alignment of pieces. That solution won’t work for Patchwork because the pieces are contiguous – you couldn’t separate them out into individual grid sections. You’re left them trying to make them fit together in a way that is reflective of the game state, and that can be a challenge. If you were happy to play it with someone else enacting your instructions though, it’s a game that does offer a degree of precision in verbalisation. ‘Pick the third piece, pay four buttons. Flip. Rotate left. Rotate left. Place it in the third row and the fifth column’. You’d lose a lot of the satisfaction that just comes from manipulating nice game pieces, but you would be able to meaningfully play the game. So, we offer a tentative recommendation for Patchwork – if you had someone able to action your turns for you, you could meaningfully verbalise your instructions and have the same tactical and strategic experience as everyone else. But you absolutely need that person available. If there isn’t someone to fit that bill, we don’t recommend Patchwork at all. There are no language issues, no need for talking, and no requirement for communication of strategy or perception of sound. No matter your category of communication impairment, anyone could meaningfully play this game. 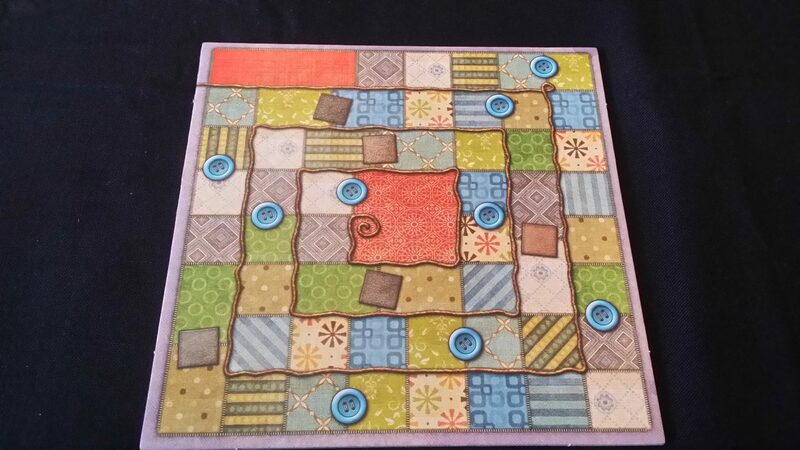 There are no serious socioeconomic issues in Patchwork. The theme may be a little off-putting for some, but really it’s just an abstract puzzle game that just happens to use the aesthetics of quilting. The game doesn’t do a great job of selling itself though in terms of the box art, so that might be a bit of an uphill struggle if you’re trying to convince someone to give it a try. The artwork is as abstract as the game itself – there are no gender roles, no representations of nationality or ethnic groups, and no troublesome language in the manual. It gets a clean bill of health. Cost wise, it’s a reasonable £20 for a small box with plenty of nice quality components. We have no doubt you’d get your money’s worth of entertainment from it, although the small player count may be discouraging if you’re looking to maximise enjoyment for a family. Only two people can play at a time after all, and other games offer more opportunities for larger groups to play well together. While there is a tactile differentiation between the five and ten button pieces, it relies on a certain degree of ability to tell the difference by physical manipulation. If a visual impairment were to be coupled to a physical impairment that limited sensitivity or movement in the fingers this would be more difficult to do. Similarly, the tactility of the game for the blind is dependent on there being no intersectional complications – the game would be unplayable for blind players if they were unable to physically discriminate pieces by touch and feel. For those where a communication issue is coupled to a physical impairment, the sole route to playability would be blocked off – our tentative recommendation in the physical impairment category is contingent on someone being able to verbalise their instructions. If that’s going to be a problem, we’d advise you not consider Patchwork as an appropriate game. The game does not meaningfully support drop in and drop out, and having only two players means that if one player is in distress the game is going to have to end there and then. That’s a shame, but play sessions are actually relatively brisk. Twenty to thirty minutes is the expectation on the box, although this would have to be increased appropriately when dealing with compensations for impairment. The game duration is short enough though that physical distress is unlikely to be exacerbated. That’s a lot to take in, so let’s stitch it into a quilt and see if it comes out… quilty? I don’t know. I’m sorry. I don’t know why I said that when I had nothing to end it with. Sometimes I just start writing and hope my fingers know better than I do what’s going to happen. Let’s… let’s just look at the grades. But what does our quilt look like? It’s an impressive performance – despite being a game with a lot of visual parsing and physical manipulation, it’s still one we’d recommend to almost everyone. For the physical accessibility section, we stress again that while the game is playable, you would lose the tactile fun of actually creating a quilt with your hands – we can’t really dock marks for something as intangible as ‘the fun of playing with components’, but we do want you to bear it in mind. For the blind, we have given it a relatively glowing endorsement but for serious visual impairments you are still going to need someone there that can read the cost information on the tiles. We gave Patchwork four stars in our review, because it’s a lot of fun and permits a perfectly formed 20 or 30 minutes of quilt-making enjoyment. If you like the sound of it, check it out because there’s a very good chance you’ll actually be able to play it! If someone had physical difficulty placing the pieces could you maybe just draw a square grid and mark with a pen which ones you’d placed a quilt piece on? My comments about graph paper were about using it as a replacement for the board, placing the pieces on it, but you absolutely could bypass the whole tile aspect of it if you wanted to just mark it out on paper.